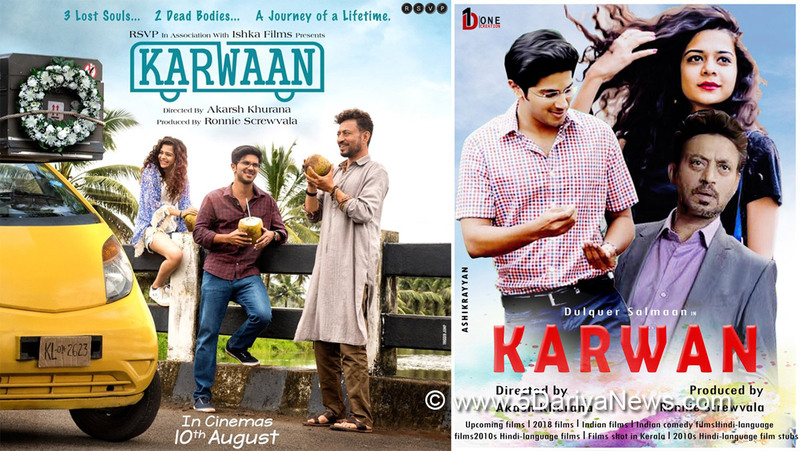 Focusing more on the journey rather than on the goal, "Karwaan" is a light-hearted comedy, designed as a road film. So obviously, you have little of the road and more of the comedy which is quirky, subtle and sardonic.So like a typical, mellow and sweet road film, here the main characters leave their home on a road trip, altering their perspective from their everyday lives. They change, grow or improve over the course of their journey.The story written by Bejoy Nambiar, brings to fore the question as to how much of a story it really offers? While the setup is interesting, the payoffs and character arcs are flat and unimpressive.This is not a story of hitch-hikers ready to hit the road. But instead, it is the story of a dutiful son Avinash Raj Purohit (Dulquer Salmaan), who ensures that he performs the last rites of his father after his sudden and untimely death in a road accident while on a pilgrimage in North India. Avinash despised his father for not letting him pursue his passion in photography.Now, reluctantly working in the IT sector and based in Bangalore, Avinash goes to collect his father's remains from the airport's cargo section along with his friend Shaukat (Irrfan Khan), who owns a garage. So it is obvious that he gets the vehicle to transport the corpse. But after collecting the body, they realise that there has been a goof up. So to correct the wrong, Avinash along with Shaukat travel to Kochi to exchange the bodies. En route they pick up Tanya from her college, she is the granddaughter of the dead lady whose body is with Avinash.Their journey yields enlightenment which contains the trio's own secrets about life and loss and is peppered with moments sans any major conflict, but yet action-packed, sentimental and hilarious.The key character who brightens the screen and makes the film momentous is Irrfan Khan. His peculiar one-liners are what keep you in splits. It's not that his lines are original, but the way he delivers them, the timing et al, is what makes it unique, preposterous and memorable, ensuring a chuckle after every delivery.Dulquer Salmaan slips into Avinash's boots with grace and ease. He is the epitome of a good and conscientious boy. Mithila Palkar is natural as the bold and adventurous Tanya.Amala Akkineni as Tanya's mother Tahira and Kirti Kharbanda as Avinash's college friend Rumana, are graceful and they have their moments of on-screen glory.Visually the film benefits from the fine work of cinematographer Avinash Arun, who bathes the feature and its characters with glossy naturalistic composition.Overall, "Karwaan" is a pleasant surprise that unexpectedly ends up entertains you.